Kenya is the home of the safari. This is where safaris started at the turn of the century - and not without reason, as Kenya is arguably the most diverse country in Africa. Although not as large as its neighbour Tanzania - or Texas for that matter - the country is blessed with a rich diversity of wildlife, complemented by a mix of vegetation ranging from forests to deserts, and stunning landscapes that one feels may only be found in Africa. One of the best-known attractions in Kenya is the Masai Mara Game Reserve, a 1500 km² wildlife conservation area which is, to put it illustratively, home to virtually the "animal kingdom". The Masai Mara, or simply "Mara" as it is commonly known, is deservedly regarded as the jewel in Kenya's wildlife crown. And the diamond in the Mara's own crown must surely be the wildebeest migration, an annual spectacle that every wildlife enthusiast dreams of seeing - a million-plus wildebeest and other animals such as zebra, guided by instinct alone, crossing en masse into the Masai Mara from the bordering plains of the vast Serengeti reserve. Massive herds of wildebeest constantly on the move. Photo: Rich Robertson. The sight is one to savour with unabashed awe as the massive herds of animals first gather for days, south of the Mara and then, when dictated by their primal instincts, start the trek northwards from the Serengeti, on the way crossing the treacherous, shoulder-deep and rock-strewn Mara river. The "River Crossing", as it has come to be known, is the iconic image of the migration, as seen on many a TV channel, not least because the river is infested with large Nile crocodiles, waiting to ruthlessly pounce on the few hapless wildebeest that cannot cross the river quickly enough, or the weak and young animals that get stranded mid-current. 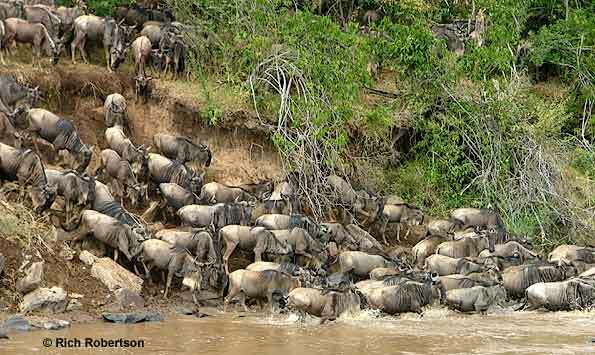 Wildebeest crossing the treacherous, rock-strewn Mara river. Photo: Rich Robertson. The migration proper, when the herds are fully on the move into the Mara, lasts well over three to four weeks. Once the wildebeest do make it through, now broken into smaller herds, they re-group on the fertile green plain of the Mara, where they feed and mate to give birth later in the year. The big cats - lion, leopard, and cheetah - follow the wildebeest, essentially their main source of food, into the Mara. So the Mara at this time is literally packed with wildlife, providing lucky visitors on safari with superb sightings of game. However, a safari to the Mara, for all the adventure, may nonetheless still be a leisurely and even luxurious affair, thanks to the quality of the accommodation within the area, ranging from luxury tented camps to safari lodges. These offer their guests every comfort they could require and more - while being close to nature and eco-friendly. Though game drives are the main activity, tourists in the Mara can also enjoy nature walks with expert guides to experience being close to nature and wildlife. Be warned though, these walks are not for the faint-hearted as you may come fairly close to the animals, while not having the safety of being in a vehicle! Another popular activity is a visit to a traditional Maasai village. The Maasai are a pastoralist community, a warrior tribe who were the inhabitants of the larger Masai Mara region. A Maasai dwelling, a type of African hut made of mud and grass, is known as a "manyatta". There are manyattas just outside the reserve where tourists can visit and get a glimpse of traditional Maasai life. Lastly, one can also indulge in a balloon flight over the Mara. This thrilling and even romantic one-hour flight is a once-in-a- lifetime experience and, though expensive, is highly recommended. Balloons gliding over the African plains early in the morning. Photo: Rich Robertson. The balloon takes off at the break of dawn, allowing for stunning views over miles and miles of the wild African plains teeming with animals, and ends with a champagne breakfast "in the bush" before a return to your lodge. Kenya, and the Mara in particular, without doubt offer the intrepid traveller one of the ultimate safari experiences in Africa. About the Author: Sanjay Shoor is a director of Shoor Travel & Tours Ltd, a Kenya-based safari tour operator and IATA travel group specialising in Quality Safaris and Travel Services in Africa.